Probably no place was a better place to get a sense of ‘what is Scientology’ in 2014 than East Grinstead, Sussex, England this past October. It was unseasonably warm and dry—only a quick, 10-minute drizzle sprinkled my three days at Saint Hill Manor, Scientology’s first fabled kingdom. I was there for the annual gathering of the International Association of Scientologists, or the IAS, the religion’s official membership organization. This was the group’s 30th anniversary; the IAS was founded at Saint Hill in 1984. 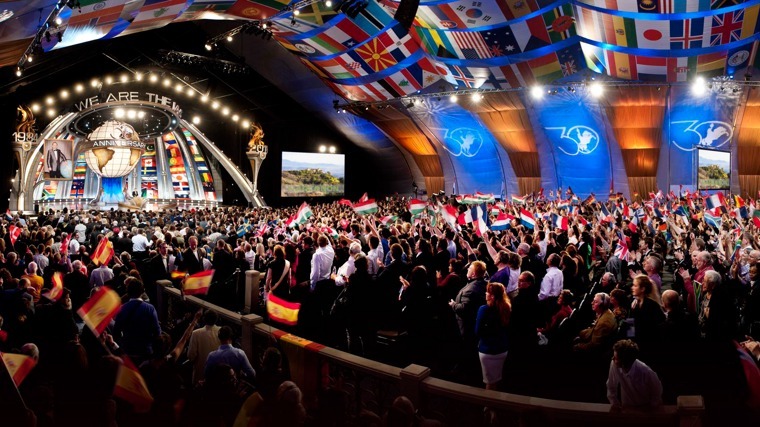 Back then, there were no fireworks, no cheering crowds—just a few dozen Scientologists who saw the need to unite the religion’s practitioners as a single, international body braced against threats to the Church, and working to advance its spiritual and humanitarian causes. Now when the IAS gets together, there is all manner of fanfare. Big tents. Big stages with big sets. Big audiovisuals—rendered almost hyper-real—of knights on steeds. Elaborate lighting shines on a legion impeccably outfitted. Even the food is grand—the caterer is in service to the Queen of England. The third course is so fancy it comes with instructions. But then, the IAS has much to celebrate; it has come a long way since its beginnings three decades ago. The group was founded to unite Scientologists worldwide, to get them engaged in the noblest of causes—elevating mankind and changing conditions on the planet toward its betterment. For Scientologists, the way to achieve these aims was researched, discovered and documented by L. Ron Hubbard. The knowledge and processes his life’s work yielded were precise and their method of application specific—it is a workable technology. The practice of Scientology applies this tech to people, relationships and situations, toward their improvement. Back in 1984, members of the IAS founding delegation signed a pledge to help and serve mankind using the technology of Scientology—and they’ve kept to it, for 30 years. Scientology is in a period of great expansion, with a growing network of Churches set up to deliver the training and services of Scientology more smoothly, more efficiently and more broadly than ever before. Church-supported humanitarian and social programs are blossoming too, among them a disaster-relief volunteer ministry; a youth drug education/prevention program; and Narconon, a worldwide network of drug rehabilitation facilities that utilizes methods devised by L. Ron Hubbard—and is expected to open the doors on seven new rehab centers in 2015. Some 7,500 IAS members, hailing from 130 countries, came together in Sussex for the 2014 anniversary event, which celebrated IAS progress in the last year and more broadly over its three decades of operation—in combating drug abuse and declining morality, in promoting human rights education, religious freedom and most importantly, the success and longevity of the Church of Scientology. Saint Hill sets quite a scene. It is the sort of place girls who dream of princes dream of—a sprawling estate with a stone manor house presiding over a sweeping expanse of parkland heavy with dewy greenery and blooms. 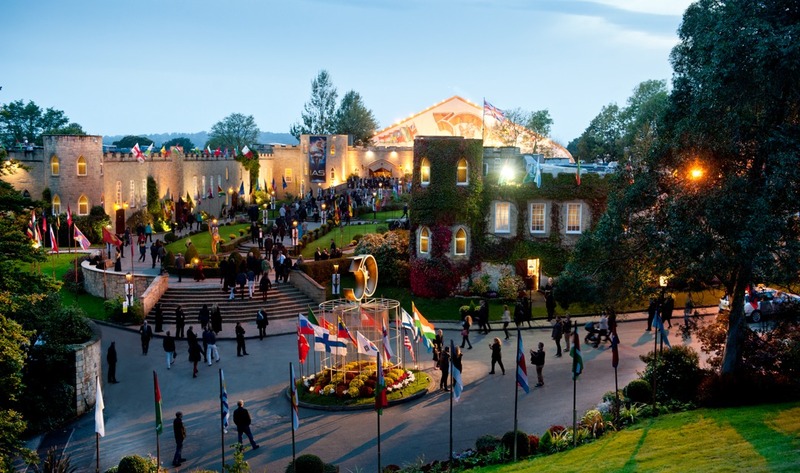 Saint Hill’s attitude of splendor and regal abundance befits its position in Scientology tradition. It is the birthplace not only of the IAS, but of many developments and discoveries central to the religion. The late 1950s was a formative time for Scientology. It was burgeoning, and L. Ron Hubbard, the religion’s Founder, recognized the need for a hub and a polestar for the Church, a global outpost for Scientology training and administration. Meanwhile, the opportunity arose for Mr. Hubbard to buy an English country estate belonging to the Maharajah of Jaipur. He did, establishing it as the worldwide headquarters of the Church. Mr. Hubbard would later describe Saint Hill Manor as “a place that was always waiting for us.” He took possession of the property in 1959, and for the next six years it would also be the Hubbard family’s primary residence. Built from locally quarried sandstone in 1792 and reportedly designed by White House architect Henry Latrobe, Saint Hill boasted 11 bedrooms and an equal number of baths; a billiard hall, tennis court and croquet lawn; a fish pond and a fishing lake; a cinema; a swimming pool; and a horse named Midnight that roamed the grounds. It also had a greenhouse, where Mr. Hubbard conducted horticultural research, pioneering the now mainstream idea that plants, animals, man—all living things—are part of an interwoven partnership for survival. serenity out of it,” he wrote of Saint Hill, recalling long walks through its gardens, and the marvel of white wisteria, something he had never seen before. Saint Hill would also become the place where, in many ways, Scientology came of age. The stillness of it did little to slow down Mr. Hubbard, who was always and truly a dynamo. For the six years he resided there, he worked and wrote 16 hours a day on a highly regimented schedule that didn’t waste a minute. Dianetics, Mr. Hubbard’s seminal work on the human mind, and the precursor to Scientology, is formed around the central principal that “to survive” is not binary. It’s more than life versus death—there are different levels, or grades, of it. A person experiencing physical pain or emotional turmoil, for example, is surviving less than a person who is pain-free, contented and emotionally fulfilled. He who is in turmoil is stymied, held back. Another key tenet of Scientology is that the things that inhibit survival are not endemic to the human experience; suffering is a pattern we’re trapped in. We intuit this, but don’t really understand why, and don’t know what to do about it. Mr. Hubbard found answers, and also devised a specific, step-by-step method for handling the quagmire, for increasing survival in this paradigm: Scientology—which is not something you believe, but something you do. Relieved of things like disappointment, failure, and the many flavors of pain, a person achieves the State of Clear and is able to fully realize and express his own happiness, ability and self. Getting to Clear isn’t a revelation, it’s a process to be done, and also delivered. The different ways in which this can play out—the route to the finish, if you will—is codified in the Classification and Gradation Chart Mr. Hubbard developed at Saint Hill. He also developed, and first delivered, the Saint Hill Special Briefing Course there. On the “delivery” side, this is the training one needs to administer advanced auditing, a form of spiritual counseling that is a central piece and practice of the Scientology religion. Even before it was internationally known as the home of L. Ron Hubbard and his family and Scientology world headquarters, Saint Hill Manor, built in 1792, was among the most historically significant estates in Sussex. Saint Hill also saw the creation of Scientology Administrative Technology, based on what Mr. Hubbard found to be a “universal pattern of successful operation for any group endeavor,” on which he would model the organizational and operational procedures for the whole of Scientology, its network of delivery, operations and system of management. His work on Administrative Technology informed a bit of civic duty he undertook while residing at Saint Hill. He drove a XK 150S Jaguar coupe that, by accounts of the day, laughed at local speed limits. The record doesn’t indicate whether he appreciated the irony, but it shows for certain that when asked by East Grinstead officials to accept an appointment to the local road safety council, he did. At the time, government regulations in the area dictated that local streets mirror the ancient Roman roads on which they were modeled. This made the lanes difficult and dangerous to navigate, resulting in a high rate of traffic fatalities in and around East Grinstead and Saint Hill. Still, he took up his work as “road safety organizer” in earnest and, as he was prone to do, in devising and executing a road safety program. He turned everything the council knew on its head. It worked. He received an abundance of letters (and illustrations) pointing out areas of perilous roadway, and newspaper coverage of the campaign, which generated even more letters. Hazard signs were put in place per the suggestions, and almost immediately, traffic injuries and fatalities steeply dropped.